Actor Rana Daggubati, who is making smart choices with equal popularity in Tollywood, Kollywood and Bollywood is thrilled about his first marriage. Not real, but screen. Rana was part of nearly 10 films, but never got a chance to enact a traditional marriage scene, which he is experiencing for the first time for his forthcoming Bangalore Days Tamil remake. 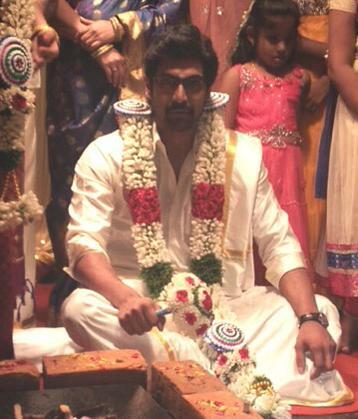 Excited Rana shared a pic of him in veshti inside Kalyana mandapam. Bommarillu Bhaskar is directing this remake venture under PVP Cinemas banner with the likes of Arya, Sri Divya, Simhaa, Raai Lakshmi, Parvathy and others.